THE Institute of Materials Research and Engineering (IMRE) is in talks to further develop and license a technology, dubbed CleanClear, which prevents the fogging up of surfaces. IMRE is a unit of the Agency for Science, Technology and Research (A*STAR). CleanClear is a hardy, permanent ceramic coating which creates a layer of water, thus preventing fogging on glass and plastic surfaces. While it may sound counter-intuitive, IMRE scientists have found that attracting water to create a uniform, thin, transparent layer - as opposed to applying a coating that will repel the water - actually delivers a better, clearer view. In a wet or humid climate, a fogged up surface can impair vision in products such as car windshields, spectacles, motorcycle visors and goggles. 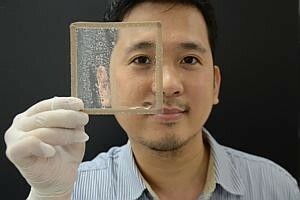 Lead scientist Gregory Goh, who developed the technology last year, said: "CleanClear could be used to help create a clear 'vision shield' for today's car windshields during heavy rain. Or we could use it to replace current daytime, UV light activated coatings with an all-day, all-night CleanClear coat on building facades to keep glass cleaner." The new patented technology can be applied on glass or plastic surfaces at processing temperatures under 100 degrees Celsius, while its durability makes the technology more cost-efficient for firms. "Although there are also other similar 'water-loving' coatings, these are often processed at much higher temperatures and can only be activated by ultraviolet (UV) rays or sunlight," A*STAR said in a press release. Current solutions in the market involve water-repelling coatings, most of which wear off and have to be re-applied regularly. While alternative coatings such as titanium dioxide can be applied to glass surfaces to prevent dirt and dust, this has to be done at temperatures above 600 degrees Celsius. As such, their use is limited only to hard surfaces such as glass.